It was at my friend Mary's place that I first had Pudina pulao/Mint rice.I was there way past lunch time and Mary had 'conveniently' forgotten to tell her mother-in-law that I would be there after finishing my lunch.Her mother-in-law had especially prepared this for me knowing that I was a vegetarian and I didn't have the heart to say no when she offered lunch. As my regular readers would know,I do not touch greens-based dishes with a barge pole[of course,it has changed to an extent now,after this and this].Mint was something I wasn't too fond of but the pulao was so good that I took a second helping[this after I had had my regular lunch! ].I loved the fact that the mint taste was not too overpowering and it was very light compared to other pulaos. I had this again at a lunch buffet at "Veg Nation",an upcoming vegetarian restaurant in Chennai where you literally have to queue up outside for their buffet.It was named Kaju Pudina Pulao in which we got a taste of crunchy toasted cashews in each bite.Now I HAD to try this.Pudina Pulao is a favorite of ours now,so flavorful and light.Try it and you'll know what I mean!! Soak the basmati rice in 2-3 cups of water for 1/2 an hour.Drain and keep aside. Grind the mint leaves with the coconut and green chillies to a paste. Heat ghee in a pressure pan/cooker and roast the cashews until golden brown (if using) and drain. Add the garam masala and saute for a minute taking care not to burn. Then add the chopped onions and ginger garlic paste and saute until it turns transparent. Add the ground paste to the pan and fry for about 2 to 3 mins until it turns fragrant. Again, take care not to burn. Add salt. Now add the soaked and drained basmati rice and give a good stir. Add 2 cups of water and let it come to a rolling boil. Close the pressure pan and cook for 1-2 whistles. Let it cool to room temperature and then open the pressure pan and fluff with a fork. Mix in the roasted cashewnuts and serve. A delicious rice dish! I love the flavour of mint...its so refreshing and yumm! Beautiful and most favourite rice, looks very tempting..
its my fav pulao..looks soo flavourful..
Can imagine the minty flavors of this delicious rice recipe. Good clicks Divya. hey divya,cn v use coconut milk, instead of grated coconut? Nags..it does look very very similar..not intentional!! Thank you everyone for your lovely comments!! Oye-Bubbly..you could use coconut milk while grinding mint leaves,but freshly grated coconut has its own flavor!! also, pls suggest sm instant snacks receipes? What a delicious rice..very tempting..
also pls suggest sm instant snacks receipes 4 d guests..
yummy !! Looks easy and delicious !! Beautiful and tempting rice..looks so good. That is such a nice pulao dear. 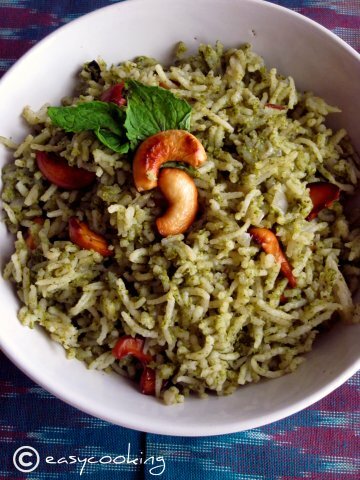 I also have to try out mint pulao as I am dying to try that refreshing mint in my pulao. TH loves mint and this looks so yummy. will try for him soon and let you how it turned out. I can almost taste the minty rice in my mouth now. ;). This is a staple in our house too - my mom used to pack these for us for lunches to school too. Love these anytime. Not a lot of people have eaten these and everytime I make it for parties, someone is pleasantly surprised!